I don’t know about you, but I have jumped on the cauliflower rice trend. It is wonderful! I’m amazed at how many times I can switch out a high calorie, flour-based carb, for a much lighter, healthier vegetable instead. The best part is that I don’t sacrifice the flavor at all! My Chicken Taco Bowl is a perfect example of that. Instead of carb laden rice, use cauliflower rice and your entire meal gets lighter, healthier and stays just as delicious. You really don’t even notice that the traditional Mexican rice has been replaced with rice cauliflower. It’s healthier, just as delicious, and filling. The meat and beans are seasoned to perfection with the classic flavors – garlic, onion, cilantro, chili powder, cumin and lime. This taco bowl is so incredibly delicious. I’m starting to crave it again just telling you about it! I love this taco bowl. It is so classically good. It’s got all those essential taco flavors, but it’s so lower in calories and Points! Each serving size is a generous bowl. Since everything in the bowl is low in Points to begin with, you can add some extras that make it that much better. I like to add a little low fat or fat free cheese, sour cream and even some avocado! Delish. Just don’t forget to count the points for your extras. If you’ve heard of cauliflower rice, but haven’t used it before, fear not. Many grocery stores carry it in both fresh or frozen. However, if that’s not the case, or you want to, you can make it yourself in just a few minutes. There’s only 2 steps to make the cauliflower rice. Remove the leaves and core from the cauliflower and break it up into small florets. Place in a food processor with a steel S blade and pulse until it resembles rice. Don’t go overboard with the pulsing, or you’ll end up with cauliflower puree. And trust me, you’ll DEFINITELY notice that it’s not Mexican rice then. It’s also possible to make it with a hand grater, but it’s much more labor intensive and time consuming. If possible, I’d recommend sticking with the food processor. If you want to save yourself a little time you can do a couple of other things. Just grab a bag of cauliflower florets. Then you don’t even have to clean it up and chop it, just stick it in and rice it. Another thing that you can do if you’re interested, is make a big batch of it. If you like it and want to use it for a variety of recipes, this is a great option for you. But don’t worry that you’ll have to eat it all in the next couple of days. Cauliflower rice is easy to freeze. To freeze the rice, make sure that there isn’t a lot of extra moisture. Portion into labeled freezer bags. Squeeze the air out and flatten so they stack nicely in the freezer. Once you’re ready to use it, you can take it out the night before and defrost it in the fridge. Or, you can defrost it in the microwave. Also, it works just as well to just put it in the pan and pop the lid on for a few minutes and it’ll cook up just right. Give this fabulous low-calorie Chicken Taco Bowl with Cauliflower Rice a try and save yourself some points. You won’t regret it! A filling taco bowl with a lot less calories! 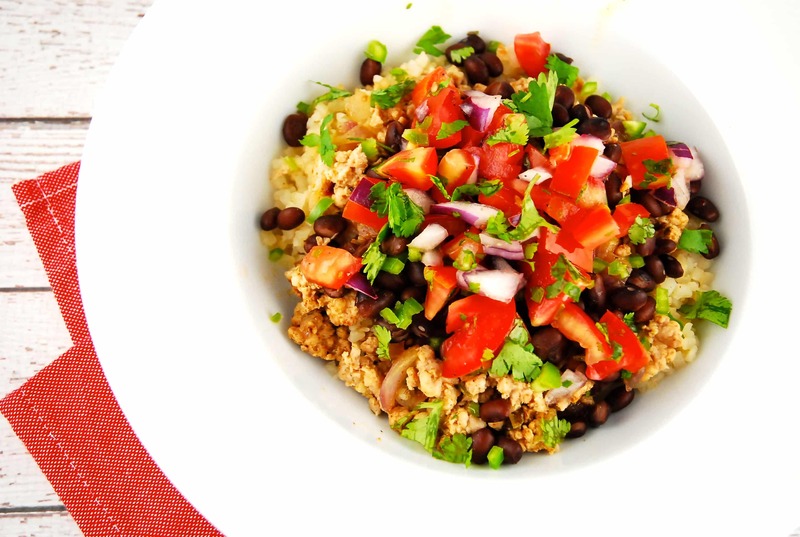 Subbing out the traditional rice with cauliflower rice helps gives this popular Mexican dish a big nutritional boost for less Smart Points. Heat oil in a medium sized skillet over medium high heat. Add in onion and garlic, and sauté for 1-2 minutes. Add in ground chicken, chili powder, cumin, and salt and pepper. Cook until meat is browned and no longer pink. Add in beans and cilantro, and cook until beans are heated, about 2 minutes. Squeeze in fresh lime juice, and stir. Transfer to a bowl, and set aside. Return pan to heat, and mist with a bit of cooking spray. Add in the cauliflower, and use wooden spoon or rubber spatula to scrape the meat juices from the pan. Stir into the riced cauliflower and season with some additional salt and pepper. Divide cauliflower evenly into 4 serving bowls. Top with meat and bean mixture. Cover with favorite toppings like pico de gallo, fresh onion, salsa, and jalapeños. Every time I press the print button on your recipes, I get the picture and the description, but not the recipe. Can this be fixed? Thank you! The same happened for me – the print thing. You just have to click print on the whole web page and then scan through to only actually print to paper the page that shows the recipe. In this case, cauliflower rice bowls, it was page two for me. Not ideal but it works!